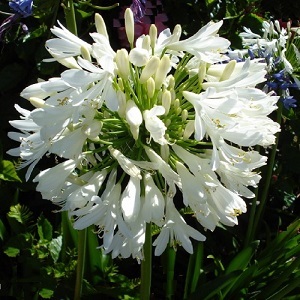 A lovely white Agapanthus with lots of dense flowerheads from July to September rising from a bed of strap-like leaves. This is an evergreen Agapanthus, growing to about 1m in height and good for a sunny warm garden or containers. In warmer climates these plants will spread out to make a striking display. Agapanthus prefers a rich well drained soil in a sunny or partially shaded site. It looks good in a border as well as pots. Protect from temperatures below -3°C /frost with a thick mulch or breathable fleece or grow in pots and bring into an unheated greenhouse over winter. Sow Sow in spring to autumn. Sow in a deep tray of seed compost, and cover lightly with compost or vermiculite. 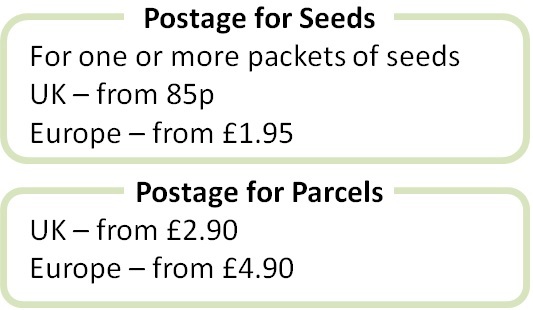 Keep at 15-18°C and germination takes 4-6 weeks. Keep the seedlings in the tray until the second season when they should be transferred into pots. Plants generally flower from the third season.